Between the moment those three words came out of Alex Garland’s mind and the moment the resultant image goes into yours, they’ve passed through the hands of several hundred people. 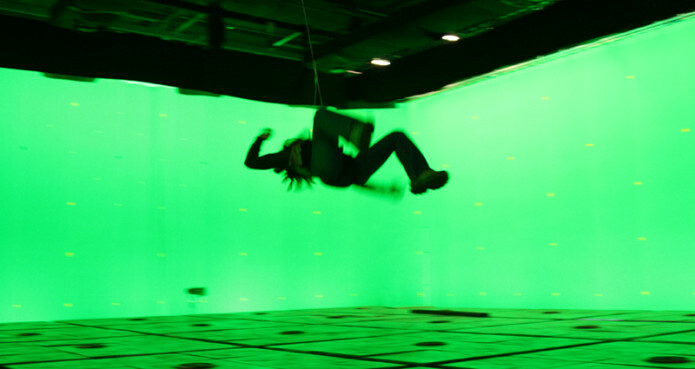 “That shot Alwin did” involved Alwin Kuchler and Cillian Murphy both getting into harnesses connected to a track on the ceiling and being ‘flown’ around the set at very high speed. After watching it back, Danny Boyle wanted to see if they could be flown around any faster. The special effects crew in charge of the wirework tinkered with the rigging for a couple days to speed the whole thing up. 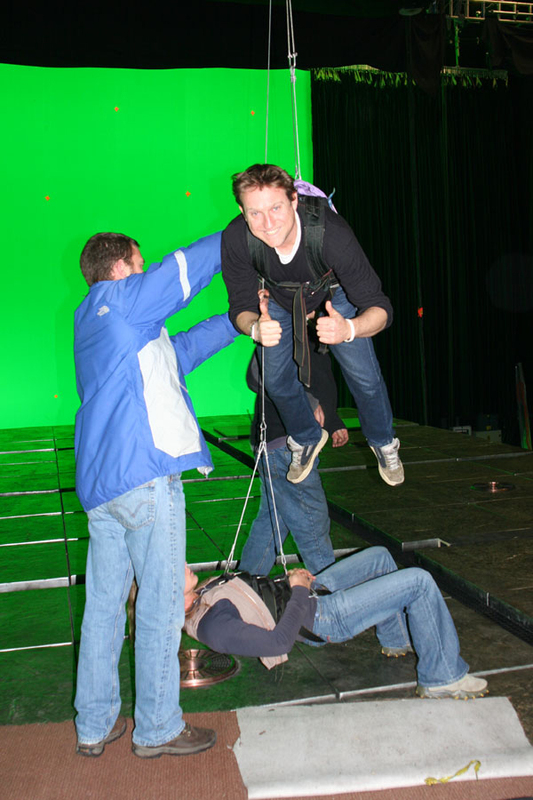 Before the main unit filmed it a second time, Julian Spencer got Kim, one of the stunt women, and Phil to help test out the new, speedy rigging. Whereas Kim is used to and trained in harness work, Phil was a complete novice. He seemed to be enjoying himself, however. They got Phil and Kim in the harnesses and up in the air. Julian wanted Phil to film the whole thing so that he could show the tape to Danny to see if it was fast enough. Along with being suspended several feet in the air and pulled along several kilometres per hour, Phil had to try to keep Kim in shot, keep the camera steady and stay facing in the same direction. This wasn’t going to be easy. The first time they tested it, Phil and Kim ended up rotating about 90 degrees and were travelling sideways rather than forwards. No good. Next, Julian ran alongside them to try and keep them heading straight, but they were started out too quickly which jerked them both forward and up and meant that Phil wasn’t able to keep Kim in shot. No good. They tried again, starting off slowly, but they weren’t moving fast enough. Next, Phil wrapped his right arm around the wire Kim was on to try and keep the camera stable, but their wires were moving in opposite directions so Kim’s wire bumped him around too much to keep a steady shot. They were lowered for a rest while the effects guys thought about what they might be able to do about keeping the camera steady. After a few minutes they decided to connect it loosely to Kim’s wire so that the camera always moved with her, yet Phil had to still make sure she always stayed in shot. Phil and Kim were hoisted up again. They were flown across the studio several more times, Phil filming the whole time. All in all it took about an hour to get about 20 seconds of footage that Julian thought was good enough to show to Danny. Phil and Kim were lowered and got out of the harnesses. Julian watched the shots back a few times then we all headed to Stage 5 where the main unit was filming. We walked in while they were setting up. About 10 seconds after we arrived, Danny walked by on his way to speak to one of the actors. Julian told him they he’d just done some tests with the new rigging and if Danny had a moment he could watch it. Phil opened up the view finder and Danny watched about 5 seconds and said, ‘Good. Thanks.’ and went back to work. And that was that. In the end they rigged up the camera to the wire which was holding Cillian and Alwin never went up again- not having two people one the wires allowed Cillian to travel much quicker and get the shot Danny wanted. The film was processed, synched up, digitised. It will be edited, graded, sound dubbed. It will be duplicated and distributed. It will be threaded into a projector, the lights will go down and for a brief moment in the film you will see Capa fly backwards.